For my Summer Ball, my friends and I decided to go as Egyptians. So yesterday (Thursday 6th June), I went hunting through loads of shops to find the right accessories which would go with my outfit. My Summer Ball is tomorrow (Saturday 8th June), so my shopping was very last minute. I found quite a lot of Egyptian style jewellery and had a hard time deciding what to buy. My 3 Way Head Wrap is from Claire's and I love it. I personally think it is quite an Egyptian look and will look good with straightened hair. It only costs £4.50 which isn't too bad. I know I have not gone for traditional Egyptian accessories which are for example from a fancy dress shop but I wanted to be able to re-use what I have bought. My bracelet is from New Look. They had so many good ones but two really stood out, the one pictured above and another one which has crosses on it. They are both a light gold colour which goes with my accessories, so I am very happy. Choosing a necklace was the hardest accessory that I had to choose. 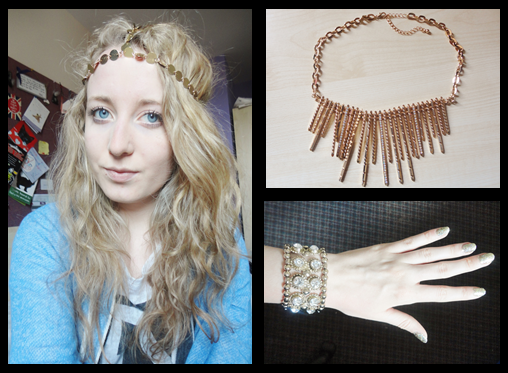 The necklace had to match the colour of my headband and the bracelet. The first necklace I liked was more of a Greek style, so that option was out. The second necklace was a darker gold and turquoise, it did not suit my other jewellery so that one was out too. Finally, the third one I liked is the one I bought. The colour went with everything and I would definitely re-use it. I got it from Primark and it cost just £5. The nail varnish I have on in the picture is a glitter gold Barry M one. I decided on gold nail polish as when I think of Egyptian style jewellery or make up, I automatically think gold or turquoise. I could have gone for just a gold colour but being the glitter fanatic that I am, I obviously went for the gold glitter option. It is available from Superdrug for £2.99.